Since the disappearance of the Oriental White Stork, Toyooka City in Hyogo Prefecture has been trying for about half a century, to set up a scheme to reintroduce the Oriental White Stork to the city. In the process of reintroduction, the assumption that the optimum environment for storks can also be a good environment for human beings was proved true. . The diverse organizations, such as local citizen groups, research institutes, project implementing agencies, government, and private sector organizations worked in close cooperation to revitalize nature and communities, resulting in an increase in the number of wild storks. In addition, the city promotes nature and community revitalization including through wildlife-friendly agriculture, wetland conservation with sustainable natural resource use, and the nurturing of young talent. In order to continue such efforts, The area was designated as a Ramsar Convention site, which will help to continue such efforts to preserve wetlands for wide use and bring together future stakeholders. Toyooka City is located in the northeast part of Hyogo Prefecture. It is bordered by Kyoto Prefecture in the east and the Sea of Japan in the north, and was formed by merging Toyooka City, Kinosaki Town, Takeno Town, Hidaka Town, Izushi Town and Tanto Town in April 2005. Maruyama River flows through the center of Toyooka, which covers a total of 697.66 km2, 80% of which is forest (photo1). Part of the coastline has been designated as San’in Kaigan National Park, while a portion of the mountainous area makes up Hyonosen-Ushiroyama-Nagisan Quasi-National Park. and Hyonosen-Ushiroyama-Nagisan Quasi-National Park in a mountainous side. In October 2010, the San’in Kaigan Geopark was approved as a member of the Global Geoparks Network. 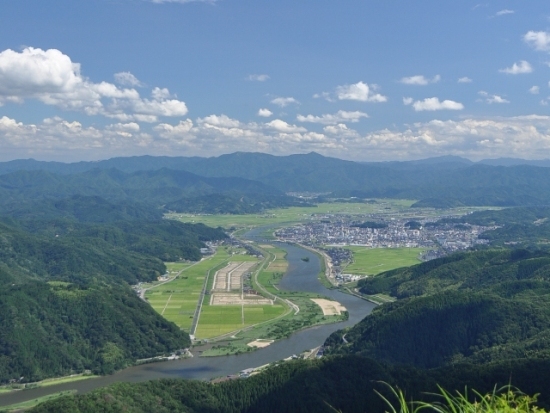 In July 2012, the Lower Maruyama River and the surrounding rice paddies were designated as a Ramsar Convention site. The population has been decreasing rapidly and is currently 85,592 (as of 2010), while the number of elderly residents (28.2% as of 2010) has exceeded the national average. The tourist industry includes popular locations such as the Kinosaki hot springs, the most famous in the country, and Kannabe Kogen, one of the biggest ski resorts in western Japan. The city is known for its production of bags, solar panels, sweets and springs. The Maruyama River runs through the middle of the Toyooka basin. The river periodically flooded especially from 1920 to 1937 until the riparian work had done. The river course was changed to help with flood control, but the river does not drain well, and and there is still damage to the city caused by a typhoon. The river rarely flows smoothly, as it has peculiar geographical features including a bottleneck at its mouth and a river bottom with a slope of about 1/9000. Recently, in autumn 2004, a typhoon caused suffering from serious floods. These conditions have caused the formation of lots of wetland areas, which are advantageous from a biodiversity perspective. . They also constitute an ideal habitat – the last in Japan – for the Oriental White Stork, which is at the top of the food chain in the rice paddies. The city is wet and cloudy due to the effects of the monsoon and the foehn phenomenon. Bags are made from the Osier (willow tree), which only grows in wetlands; hence the bag-making industry emerged and prospers due to Toyooka’s weather conditions. The disappearance of human-influenced natural environments, or satoyama, due to decreasing and aging populations has raised various concerns in terms of satoyama conservation. Although more farmers have taken up organic farming, there has been an increased level of abandonment of cultivated areas. Damage from animals such as deer and wild boars has been making the situation worse, and this trend is expected to increase. In the mountains and forests, changing lifestyles and increased use of fossil fuels has decreased the need to go into the mountains to collect firewood, bamboo and other materials for fuel or making tools. Artificial forests were also left to run wild as it is no longer customary to cut trees or do periodic thinning. Wild animals which have their habitat deep in the mountains have come out to Satoyama and farm products damage increased and Satoyama’s devastation is promoted because of damage to the food. In the rivers, the number of invasive alien species such as black bass and Clark’s crayfish is increasing, and extermination measures are necessary. In promoting preservation of the stork habitat, it is necessary to tackle many issues that harm biodiversity such as a growing number of fields and rice paddies that have been abandoned and are no longer cultivated, devastation of mountains and forests, crop damage from wild animals, and encroachment by foreign species. During the Edo era, the stork was seen all over Japan, but excessive hunting during the Meiji era caused its numbers to decrease. During 1940, pine trees in the rest of the habitat in Toyooka were cut down in order to supply timber to the front during the World War II, and the stork habitat was lost. In 1955, “the stork(Kounotori) protection cooperation” (renamed the “Tajima Kounotori Protection Support Group” in 1958) was established and protection activities between the government and citizens started. At the same time, Japan also entered a period of high economic growth which led to lifestyle change and the promotion of modern and efficient agriculture. Agriculture in Toyooka was also reformed into well-drained rice paddy fields due to consolidation of farmland. Rivers, waterways and rice paddies were divided into pieces and farmers began to use chemical fertilizers. wild storks became extinct in Japan. was the 25th year since captive rearing was started. Since the first chick was born in the captive breeding program, chicks have been born every year. In 2002, the captive stork population grew to over 100. In September, 2005, five storks were tentatively reintroduced to the wild, and they flew in the sky of Toyooka for the first time in 34 years. In 2007, a chick was born in the wild for the first time in Japan, and since this point, breeding in the wild has been continuing smoothly and the population had increased to over 60 by 2012. The stork has been living near human settlements where there are rice paddies, waterways, mountains and forests. The storks catch their food there, make nests and raise their young. These environments foster biodiversity and a unique local culture where people and animals live and are blessed by nature. they decided to reintroduce storks into the skies of Toyooka again. In Toyooka, “in order to create a rich environment where the stork also can live”, various stakeholders have worked together to promote nature conservation and restoration. The stork is a predator at the top of the food chain, and requires biodiversity and properly managed environments such as satoyama, rice paddies, rivers and waterways. Farmers first took action when the project to reintroduce the stork into the wild began, due to the necessity of increasing the number of living creatures in the rice paddies for the stork to eat. However, the rice paddies and waterways were separated and there were no creatures in the dried rice paddies. There were also many opposing opinions about reintroducing the stork into the wild, as they were harmful birds, which step on rice plants after they are planted in the rice paddies. The establishment of the “Hyogo Prefectural Homeland for the Oriental White Stork” public park raised local farmers’ awareness and led to more concrete activities. 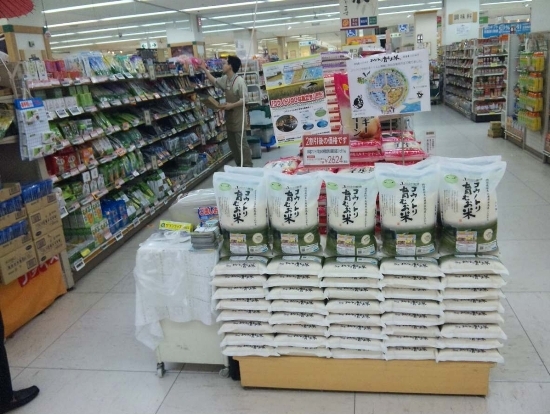 The Japan Agricultural Cooperative in Hyogo Prefecture and local farmers began to work in close collaboration. They decided to promote farming methods that provide habitats to living creatures in the rice paddies without using pesticide or chemical fertilizers. Moreover, circulatory waterways were opened in the rice paddies, and biotopes were created to keep water at the corner of the rice paddies throughout the year, which would invite white storks to the sites. Two years before the reintroduction of the stork (2003), the reduction of chemical usage was started. In the beginning, the method was applied to 0.7ha, and it was increased to 250ha by 2012. After the reintroduction of storks in 2005, the area where this method was applied rapidly increased to 8% of the total land under cultivation in Toyooka. By adopting environmentally-friendly farming methods, the farmers’ income increases, and this became one of the best examples of positive linkage between conservation and economic growth. Recently, abandonment of agricultural fields and rice paddies has increased due to depopulation and aging in Toyooka. The city started to subsidize the land owner to create biotopes in order to revitalize their abandoned lands. As a result, 18 and 12.2ha areas of biotopes has settled (as of 2011). These biotopes are also used to a biodiversity education in primary school. When Toyooka City started to reintroduce Oriental White Stork in 2002, one wild stork flew over the sea from the mainland to Toyooka. It was called “Hachigoro”, and settled in the rice paddies at the mouth of the Maruyama River. Water control management was undertaken in the Maruyama River at that time to recover from the flood damage in the autumn of 2004, but part of the construction plan was changed to create artificial wetland (Photo 4) to preserve a feeding area for wild storks as well as to conserve an important endangered species. This artificial wetland is called “Hachigoro’s Toshima Wetland” and is conserved by an NPO. Several important research activities are being undertaken by the NPO, including research focused on appropriate wetland management, and the areas are open to the public. Since 2008, nests have been installed in the wetland areas and wild storks have bred and multiplied for over five years. Many people come to the wetland to watch storks bringing up their chicks in the springtime, and to watch wild birds all year round. Many volunteers help with the wetlands management work. “Tai” village is located in the northeastern part of Toyooka City, and is characterized by a half-farming and half-fishing lifestyle, which had been maintained since ancient times, but all areas were abandoned by 2006. A stork that had grown up in Hachigoro’s Toshima Wetland landed in this abandoned field in the spring of 2008. Following these steady efforts, researchers pointed out that Tai is a biodiversity hotspot, and important place for storks, as many different aquatic creatures and rare species live there. Networking is expanding as local people, private companies, local government and researchers have started to help conservation efforts. Local people also started to organize a training course for guiding outside visitors to the Tai region. This became a good practice for promoting both nature restoration and community revitalization. 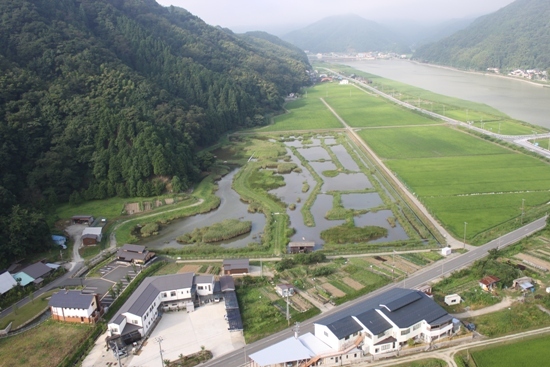 The Ministry of Land, Infrastructure, and Transport prepared the “Maruyama River Water System Nature Restoration Plan” in order to conserve and restore biodiversity as well as support associated recreational activities and enhance disaster prevention. As a result of this construction, there was 1.5 times as much wetland area on the Maruyama River in 2012 compared to 2005. In order to revitalize the city, the Toyooka City government further promoted the “Reintroduction of the Oriental White Stork” activities. To achieve the convenience of modern life, some things have been sacrificed, and this process has resulted in the extinction of the stork. Toyooka City has kept this in mind and has promoted a plan for creating synergies between environmental sustainability and economic improvement. On 3 July 2012, the 560ha “Lower Maruyama River and the surrounding rice paddies” were registered as Ramsar Convention Wetlands. The committee highly appreciated how rare storks have started to steadily inhabit the environment due to human involvement and the increasing richness of the wetlands. One of the reasons why the area was registered under the Ramsar Convention was to recognize the importance of maintaining the environment in which we live with the stork, for the future of these globally-important wetlands. Schools and communities have organized a series of training courses for the younger generation in close cooperation with the local government and an NPO.. Training courses with local people include rice farming using the “White Storks Friendly Farming Method” in elementary school, providing a biodiversity lecture that is held on site in the biotopes, workshops on local tourism, and environmental education. Once a month, the NPO provides an opportunity for children to have field experiences in areas such as rice paddies, rivers and satoyama in Toyooka City. In the process of reintroducing the Oriental White Stork, it was apparent that human beings had lived harmoniously with nature, and it is important to carry on that tradition into the present day. We have worked to restore an environment in which the stork can live, while we also keep our present life in Toyooka. It is necessary for diverse organizations to work together to create a sustainable environment under our motto: “to create a rich environment where the stork also can live”.